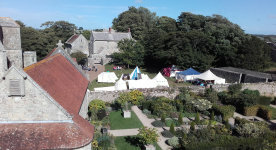 These camps are not necessarily representing a particular time or event in the 15th century, but may demonstrate a range of activities, crafts, skills, food and general life of the period. They are all fully public interactive and we welcome questions and queries. The layout of each event varies according to the venue or availability of the interpreters, but the tents and awnings are based on images and contemporary manuscripts allowing public access and engagement. The camps are a centre of interest and amusement to a range of age groups. It is important to us to arrange the camps in such a manner that the public can see, walk through, understand it and talk to us when they want to. Major organisations such as English Heritage, National Trust, Historic Houses, along with other smaller venues, are becoming increasingly interested in the smaller, totally interactive groups like ours. If the visitor enjoys their day they may spend a little money and come again.